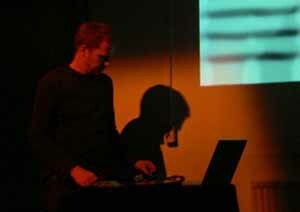 Robert van Heumen is working with electronic, experimental, improvised and composed music, music-theater and sound art. Recent works include 5.1 surround compositions '12 Bullets' and 'Fury (after anger)', music for the choreography Drink Me by Anouk van Dijk, and the audio-visual sound art piece Solitude (with multi-media artist Arnoud Noordegraaf) based on a book by Paul Auster. As a musician he uses STEIM's live sampling software LiSa and real-time audio-synthesis and algorithmic composition software SuperCollider. He is active as a member of the electro-acoustic sextet OfficeR (with Koen Nutters cs. ), electronic audio-visual trio SKIF++ (with Jeff Carey & Bas van Koolwijk), scratchband RKS (with Keir Neuringer & dj sniff), Shackle (working with Anne LaBerge on restriction), founding member of the N Collective, and has shared the stage with Tom Tlalim, dj sniff (Takuro Mizuta Lippit), Michel Waisvisz, Richard Barrett, Oguz Buyukberber, Luc Houtkamp, Guy Harries, Morten J. Olsen, Daniel Schorno, Roddy Schrock, Audrey Chen and Nate Wooley. His soundworld is a mixture of digital crackles, environmental sounds, voices, sounds from kitchen appliances, half of the time smashed beyond repair. Next to all of this he is Managing Director of the STEIM foundation in Amsterdam, curator of the Local Stop concert series and member of STEIM's Artistic Committee. In a previous life he was a mathematician, trumpet player and software programmer. He still reads L.E.J. Brouwer.